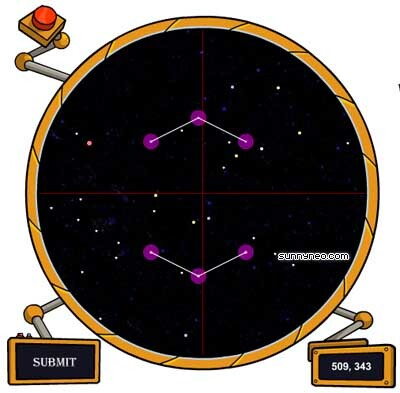 Hmm... constellations... constellations... where is a good place to find a conste--OOH! Disco! 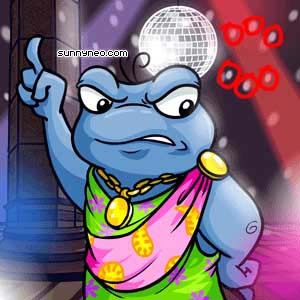 Stop by the Disco Club and chat with a not-so-happy Quiggle. all your friends with your funky style!" enter. "You again?! I don't want the likes of you in my club!" new members at the moment. No disco for you, but wait... what an odd shaped formed by those light-spots! Click one of the six spots circled. When you do, you will see the pattern of your 5th constellation. Now that you've got what you came for, take a trip to the Archives and visit your good friend Finneus. in some kind of underground dancing establishment operating on the premises?! Who authorised that? Go, find that constellation, I've got to deal with these hooligans." You know where to go now, your telescope! Click submit and there's your fifth constellation, congratulations. only looks at you for a moment as you enter, then looks away. 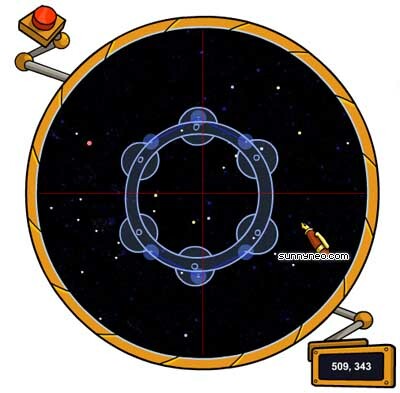 constellations..." He shakes his head and returns to his telescope. is responsible and stop them! Altador's knowledge must be restored!" As with the last constellation, a few other things have been updated. If you click on the statue of the Sasha, then click on the tippy top of the picture, you will see the gems above her head are lit up!